Located 90 minutes north of New York City in the western Catskills, the Clipper Cottage is a country retreat. Set on an acre next to Yankee Lake and on the top of the West Shawangunk Ridge in the scenic Catskill Mountains. The house has 2 bedrooms, one with a super comfortable memory foam queen mattress and the second room has a full spring bed with an equally comfortable quilted mattress topper. Each bedroom has a spacious closet. There are 2 full bathrooms, one located upstairs and the other downstairs. The upstairs has an extra deep bathtub great for long baths while the downstairs has a newly renovated glass shower. You can look down on the first from the second floor landing. Stay cozy by the wood burning stove in the living room with a 3 seater sofa and a large arm chair. The high ceiling and open layout make the home feel very spacious and airy. The kitchen is newly renovated with stainless steel appliance and a dishwasher. In the dinning room the table can seat 4-6. It leads to sliding doors with a small patio and two outdoor arm chairs. This spot is perfect a morning coffee or glass of wine in the evening. A favorite spot is the reading nook next to the living room. Surrounded by windows, it's easy to curl up with a book and drift off for an afternoon power nap. From spring to fall, the property is just about spending as much time outside as it is inside. In an area to the right of the home is a landscaped section with chaise lounges, outdoor poufs, and a portable fire pit. This area is great for tanning, reading, relaxing or roasting marshmellos. To the left of the property by the porch is a large outside dining area with table seating for 6. There is also another fire pit with seating. On the lawn near the edge of the woods is a Buddha statue, an ideal place for some meditation. If you walk 5 minutes down the end of the road you will reach the entrance to Yankee Lake. It's a year round lake. In the summer it's perfect for swimming, paddle boarding, tubing, fishing, canoeing and kayaking. In the winter there is ice fishing and ice skating. Note that there are no gas motor boats allowed on Yankee Lake which means it maintains its pristine quality all year round. 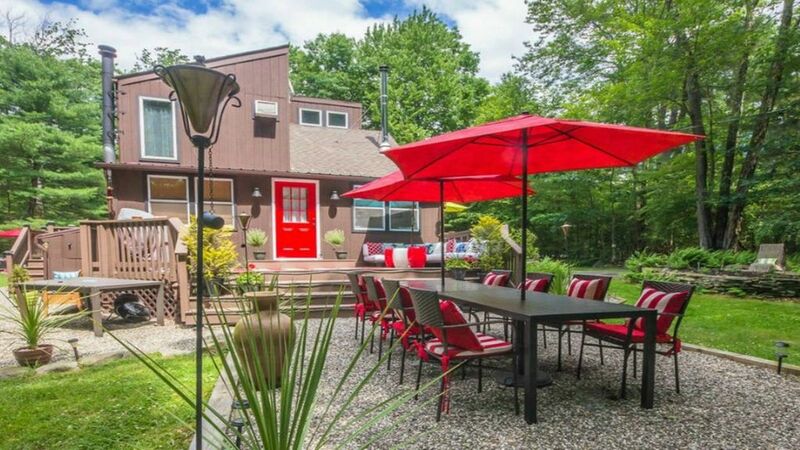 The Clipper Cottage is the perfect Catskills holiday getaway located on Yankee Lake, 90 minutes from NYC. Very accessible during the fall and winter months, just 10 minutes from NY-17. Ski and snowboard at Holiday Mountain (15 mins), ice fishing on Yankee Lake, hunters welcome as the season is approaching, visit breweries and distilleries, and much more. But the holiday season is also a time to relax! We have a wood burning stove, wifi, games, books, and space to have a lavish dinner. Located in the Blue Room. If you open the windows the house cools very fast. Dishes and utensils are there to use. Also pots and pans and some baking sheets. French cabinet doors and cutting board countertop. LG SMART TV. We don't have cable but we have Netflix and HBOgo. We also have a HDMI cable for you to hook up t your computer to watch on the TV. What an adorable place to stay. We arrived very late night and only stayed one night but everything was great! This adorable home is very clean, comfy beds, fluffy pillows and very soft sheets and comforters :) Everything was cozy and the owners were very accommodating and helpful. Highly recommend. We spent 4 lovely days, mostly inside as it was freezing temperature outside. Landscape was all snowy and beautiful and we had the honor to get an early morning visit from 3 deers. The house was very cozy and comfortable, the wood stove was much needed and worked perfectly well. The house is dog friendly and our dog loved it at fist sight! The only downside would be the kitchen stock: only few plates and utensils, bring your oil/vinegar...not suitable if you want to cook for more than 2-3.
very nice house! had everything we needed. the nearby lake was a great plus! the house did not disappoint and the owners went out of their way to answer any last minute questions. all in all, very relaxing- and very close to NYC! It was a great place to stay! I wish we had more time to enjoy the area. The home was everything we were looking for. We enjoyed seeing two deer outside of the kitchen window in the mornings. In our brief time we enjoyed a ride to see some covered bridges North of the area. If in the area I would definitely stay again and would recommend it to anyone traveling in the area!